Simple DoF Calculator: Great for calculating depth of field for your camera and lens! For now, let’s take a closer look at the Simple DoF Calculator. The Simple DoF Calculator is very useful when calculating depth of field for your camera and lens. Depth of field refers to the distance between the nearest and farthest points that are in focus in a photograph. 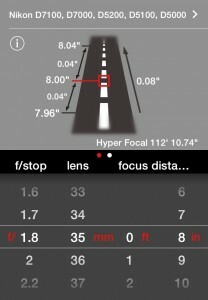 The points are more specifically known as the near focus limit and the far focus limit. To visualize this, take a look at the image above. 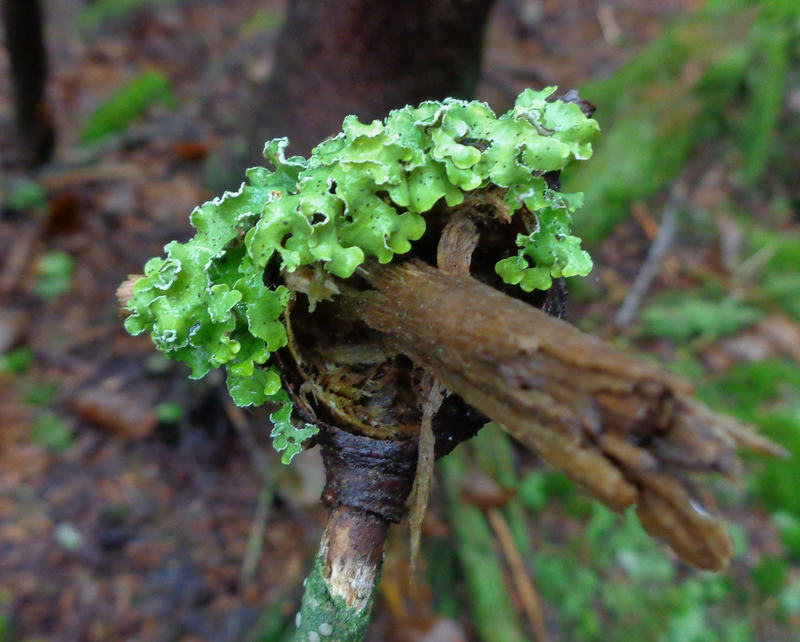 The branch in the foreground is out of focus most of the way into the image. The point where it becomes clear is the near focus limit. The depth of field incorporates the foliage that is in focus. Behind the bright green leaves, the far focus limit is reached; at this point elements further back are out of focus again. This draws the eye in and helps the viewer see exactly what’s of interest! Would the same scene with everything in focus have a similar feel? It’s very insightful to know what capabilities your camera and lens will have for depth of field. This is where Simple DoF Calculator comes in handy. There are several apps similar to this one; however, the DoF Calculator is easy to use and demonstrates the key concepts well. Let’s give it a try! 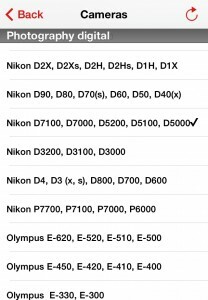 Tap the arrow icon on the far right in order to choose your camera from the list of available options. After selecting your camera, you are returned to the main screen. Three more steps and you’re on your way to determining your depth of field! 1. Choose the length of your lens by swiping the numbers to scroll up or down. Note: Smaller f/stops like f/1.8 let more light into the camera and will yield a shorter depth of field. Larger f/stops like f/22 will let less light in and create a longer depth of field. To makes sense of this, imagine staring at one leaf on a branch with your eyes wide open compared to blinking your eyes to see the same scene. Your focus will change in each case, as it will in the photograph. 3. Set the focus distance to center the viewer’s attention. The camera was then held 8 inches from the scene. 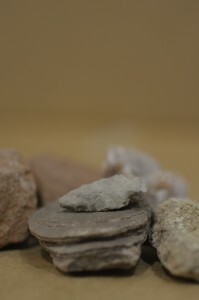 Can you see how the arrowhead is in focus while the rest of the rocks in the photograph are blurred? This implies the near focus limit is before the arrowhead and the far focus limit lies behind it. This draws the viewer’s eye to the arrowhead because of the crisp lines composing it compared to those of the neighboring rocks. With this newfound knowledge, why not test the limits of your camera and lens with depth of field? Knowledge of what your camera and lens are capable of is power. Use the Simple DoF Calculator App to determine what depth of field is desirable for your specific scene. How much of an image will be in focus when your camera is 8 inches from the subject? How about 8 feet? Focusing your lens at the hyperfocal distance will ensure that your subjects will be as “in focus” as possible. In other words, when the far focus limit is as far as the camera can see, the depth of field is maximized and your hyperfocal distance is reached. This is another key piece of information to understand about your setup, especially if you’re primarily a landscape photographer. Consider a depth of field calculator as another handy tool in your photographer’s toolbox and use it to avoid getting hyper in the moment of taking an impressive picture. Need more help mastering these concepts? Register for one of our Digital Photograhy courses today!